The Cawthon Cartridge Club (Millican, TX) hosts the 2010 LaRue Tactical Multi-Gun Match this weekend, May 8-9. More than 220 shooters will compete in eight (8) stages of fire using pistol, rifle, and shotgun. This is action shooting, with lots of movement. Shooters negotiate obstacles, run to firing positions, and engage targets from multiple positions, often firing through ports or around barricades. Targets are placed at distances from a few yards (pistol) to 500 yards (rifle). With stage names such as “House of Pain,” “Jungle Run,” and “Tunnel Rat,” this match will challenge the competitors’ shooting skills and physical abilities. With temperatures predicted to reach the 90s, competitors must battle the heat and the sometimes high winds as they run through stages and take long shots with their rifles. Pre-match favorites include Taran Butler, Kelly Neal, and Bennie Cooley, but there are many lesser-known shooters who could end up on the podium. 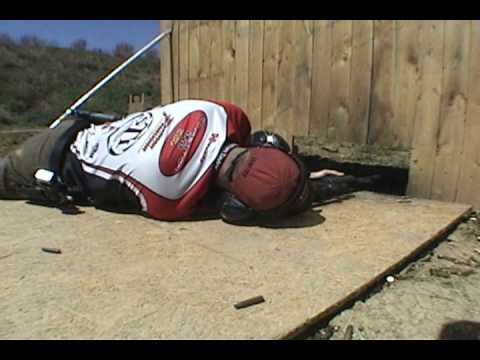 The video below shows Stage 8 from the 2009 LaRue 3-Gun Match, held at the Tiger Valley Tactical Institute range near Waco, TX. Share the post "LaRue Multi-Gun Tactical Match This Weekend in Texas"
If you use an AR-platform rifle for varminting, multi-gun matches, or Service Rifle competition, one simple upgrade you can make to enhance reliability is to replace the mil-spec gas rings with a one-piece McFarland™ bolt gas ring. The McFarland ring is a single spiral of spring steel that loops around the bolt three times and leaves no path for gas leakage. With conventional gas rings, you need to correctly rotate each ring so the “gap” does not line up, thereby allowing gas blow-by that can cause cycling problems. The one-piece ring is an inexpensive, “set and forget” solution that eliminates the need to monitor your ring position on the bolt body. The McFarland™ one-piece bolt gas ring can be purchased from Brownells for $3.99 (item 100-001-257) or from Fulton Armory for $2.99 (item FA-AR-300-109). Purchase three or four at once to save on shipping costs — that should be enough for a decade of AR shooting. Share the post "Tech Tip: Fit One-Piece McFarland™ Gas Rings in Your AR"
Thanks to Savage’s signature barrel nut system, it’s easy for Savage rifle owners to swap barrels without gunsmith assistance. With a pre-fit barrel from Pac-Nor or Shilen you can easily re-barrel your rifle and set the headspace with go/no-go gauges. In addition to a barrel vise, you’ll need a specialized barrel nut wrench to swap Savage barrels. Now through 5/31/2010, MidwayUSA has the Wheeler Engineering Savage Barrel Nut Wrench on sale for just $22.99, marked down from $38.49 (a $15.50 savings — roughly 40%). For comparison, Brownell’s charges $47.90 for the Sharp Shooter Supply Savage barrel nut wrench. The double-ended Wheeler Savage Barrel Nut Wrench (item #288765) allows easy removal of the barrel nut on Savage model 10, model 110, and model 12 series rifles. Made from 3/16″ steel, the Wheeler tool features two 1/2″ square drive holes for a swing bar or torque wrench. Share the post "40% Off Savings on Savage Barrel Nut Wrench"